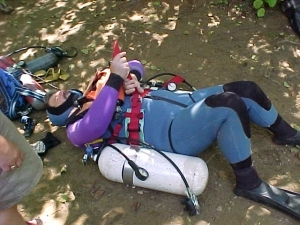 This page provides links to a selection of photos which illustrate methods of configuring equipment for sidemount cave diving. DISCLAIMER: This resource is no substitute for professional tuition. The author assumes no responsibility for the way information presented herein is interpreted. This page is provided solely for entertainment only. For more details see the Wikipedia page on this subject (which contains many of the pictures included here with my premission). 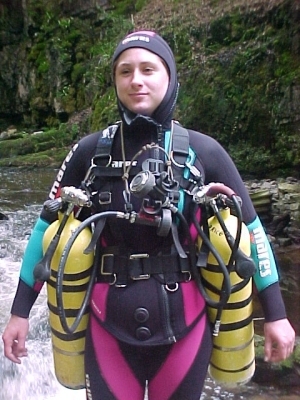 Cave diving in the UK evolved out of dry caving rather than open water diving. Cavers became cave divers. 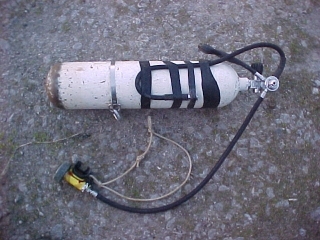 Cylinders were fitted with belt loops and simply slid onto the standard caver's belay or battery belt along with lead weights and the caver's belt mounted battery pack. 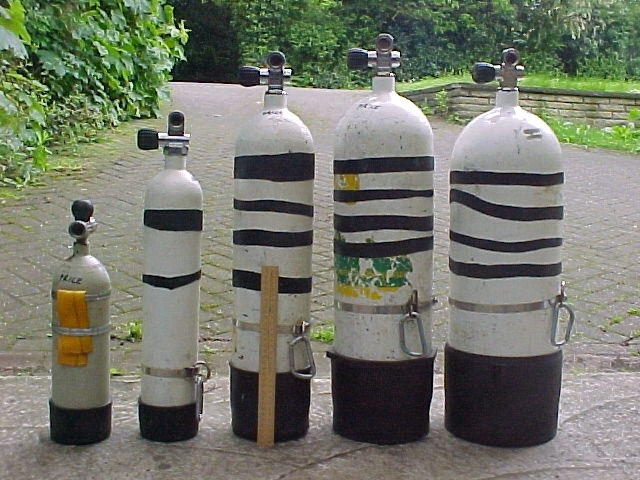 For many years this was the typical configuration for British sidemount diving. 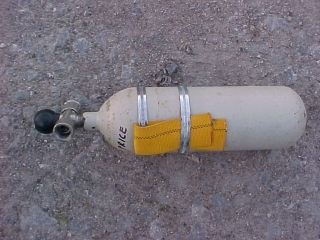 britishsidemount1 (73 kB) - shown here with two small tanks (for which it is still eminently suitable). Everything goes on one belt and can be difficult to don unless one lies down. As penetration distances into caves increased, the belt was replaced by a more sturdy affair with additional shoulder straps and a padded waist band to distrubute the load more equally. The obvious disadvantage with this system is that both cylinders and any lead must be threaded onto the harness before it is put on. 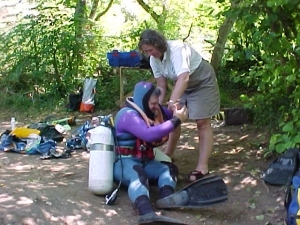 This generally caused the poor diver to have to kit up on his backand often be assisted to a standing position by a helper. 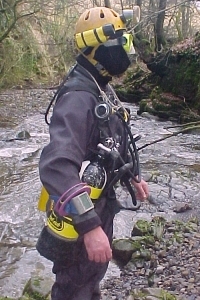 The current style of diving sidemount in the UK was actually imported from the US by Peter Bolt in the early 1990's following his dives in Lechugilla Cave. Rick Stanton and then Duncan Price adopted it and popularised its use through articles in the CDG Newsletter and by word of mouth. The modern rig finally gained acceptance when Joel Corrigan designed the first commercial harness for this system in conjunction with Dragon Caving Gear (no longer available). 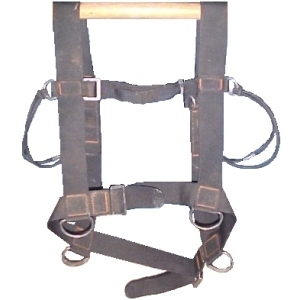 Currently equivalent harnesses are avalible from FarrWorld) and Warmbac. dragon2 (114 kB) - side view of Dragon ASM showing the underarm attachment point for the top of the cylinder. dragon4 (116 kB) - Dragon ASM plus two 7 l tanks (front). dragon5 (93 kB) - close up of the top cylinder attachment. 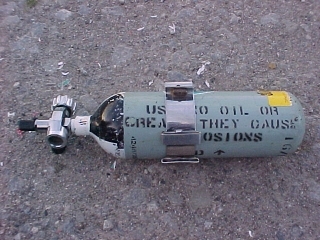 dragon6 (58 kB) - rear view of lower cylinder attachment. 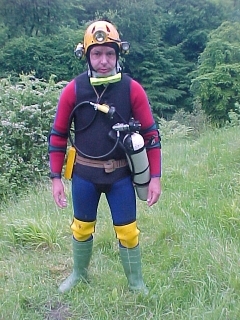 dragonablj (92 kB) - this wetsuited diver is wearing a horse collar lifejacket for bouyancy control. 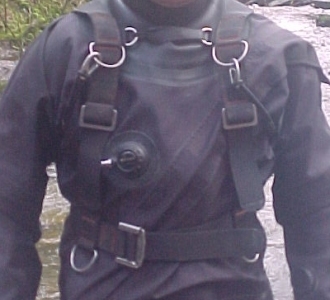 For many shallow sumps a wetsuited diver would not wear a BC but trim themselves for neutral bouyancy on the surface and control their trim by depth of breathing. 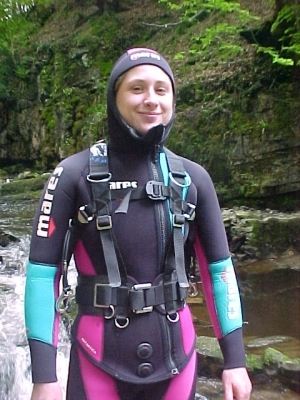 The major difference between UK and US styles of sidemounting is the use of the drysuit (when worn) both for thermal protection and for buoyancy control. Hence the UK harness is a simple webbing affair that has evolved from the old style belt loop attachment. Paticular advantages for British divers of this system is the ease which cylinders can be donned and doffed particularly before and after diving at sumps with restricted physical access. 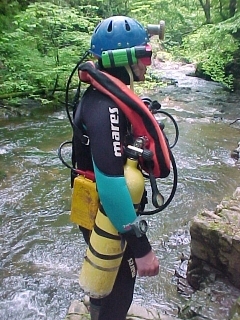 The problem with the "standard" UK rig is that the harness essentially evolved from the older waist mounted cylinder rig (and can still be used for such). The padded waistband is over-engineered for the modern style of diving and thus bulky to transport underground. By dispensing with any unnecessary components a much simpler, lighter weight harness can be constructed out of 50 mm (2") webbing, some narower 25 mm (1") webbing, elastic cord and a few D-rings and clips. harnessschematic (15 kB) shows a scale schematic diagram of the harness. 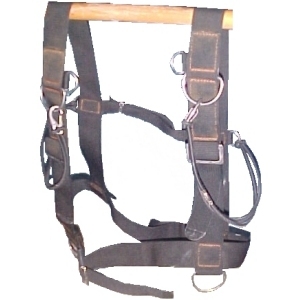 harnessfront1 (42 kB) and harnessback1 (42 kB) - show front and back views of the lightweight harness. 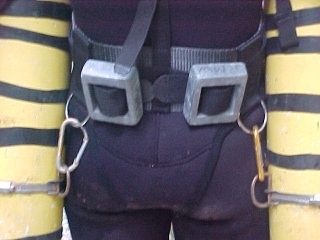 A waist belt holds four large D-rings: two at the back positioned over the kindneys serve to attach the base of the diver's primary cylinders to and two at the front for accessories such as stage cylinders. Shoulder loops link the front and rear belt D-rings and carry large chest D-rings to which the elastic cord used to secure the top of the cylinder is clipped off, above these are two smaller D-rings which can be joined via a chest strap to stop the shoulder straps slipping down (if required). The elastic cord fixed at its other end to smaller D-rings over the wearer's shoulder blades. 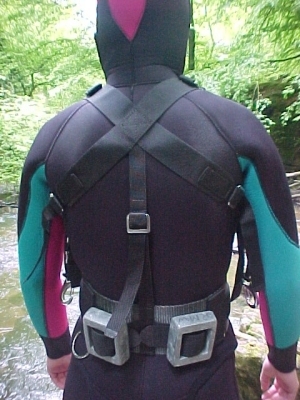 The back of the shoulder straps are held together by an adjustable length of 25 mm webbing and likewise the spacing of the rear primary cylinder attachment points can be changed using a three bar buckle on the waist. 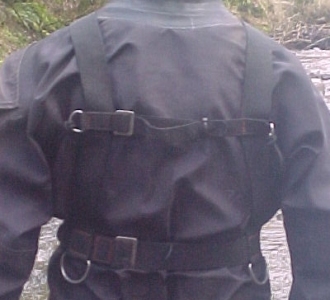 harnessfront2 (60 kB) and harnessback2 (57 kB) - show front and back views of the lightweight harness on a drysuited diver. A rubber loop and clip are used to link the small D-rings above the chest D-rings to hold the shoulder straps in place. harnessfront3 (85 kB) and harnessback3 (76 kB) - show front and back views of the complete rig with the lower part of the cylinders attached at the back to the rear waist D-rings and at the front by looping the elastic cord around the pillar valve at the top of the cylinder. 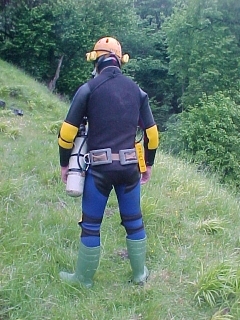 A seperate belt is worn around the waist to hold a couple of lead weights and a battery pack for the diver's light. harnessside1 (68 kB) and harnessside2 (68 kB) - show side views of the complete rig. 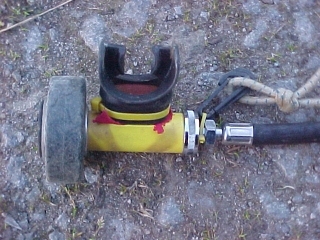 Stage cylinders can be carried rigged in the same way as primary cylinders except that the base attachment point is secured to one of the front belt D-rings and the top of the cylinder can either be fitted with a clip and attached to a shoulder D-ring or a thick loop of elastic cord (see below) can be owrn around the chest and pulled over the top of the cylinder. 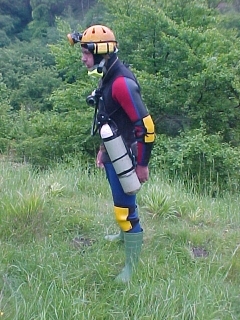 In this way, stages are worn on the diver's chest. 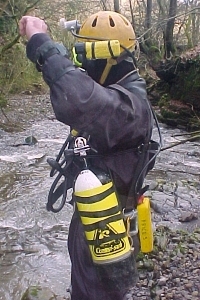 By releasing the top of the stage cylinder it can hang between the diver's legs and thus draged behind through any restrictions without having to be removed completely. 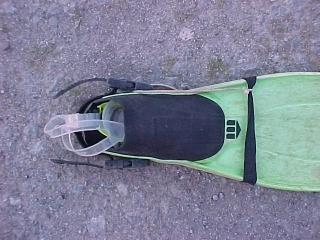 A crotch strap (if preferrred and for scootering) can be added using a length of 50 mm webbing of the appropriate length with loops at both ends. 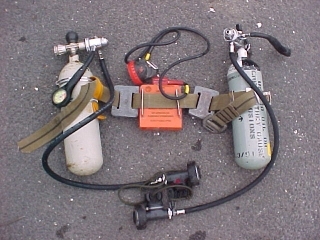 One end is threaded around the back of the belt loop between the primary cylinder D-rings and the other end is slipped though the front of the belt when the harness is put on - a D-ring in this end is then used to attach the scooter tow strap to the diver. This simple set up can be used for passing short sumps a long way inside caves. The set up is very simple and easy to put on and remove. For short sections of underwater passage, fins are often not worn either. 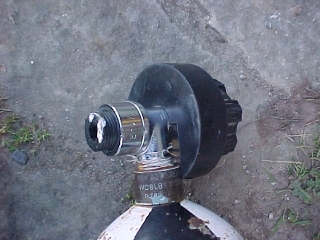 simplesidemount1 (73 kB) - a lightweight sidemount rig can be made from a bit of elastic webbing wrapped around the top of the cylinder. Note the long HP hose for the pressure stowed neatly beneath the inner tube loops. 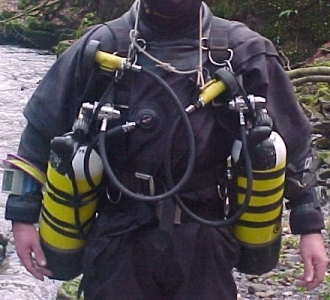 simplesidemount2 (76 kB) - lightweight sidemount rig with the top of the cylinder held by a loop of elastic cord worn over the shoulder. The bottom of the cylinder is clipped into the caver's battery belt. 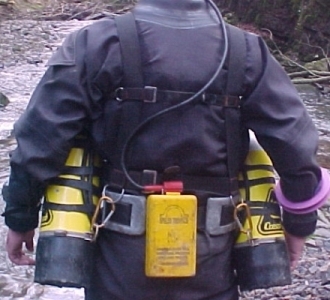 simplesidemount4 (84 kB) - backview, note that the lead can be put on a separate tape sling for ease of removal. beltattachment1 (70 kB) - small cylinders such as this 2 l (15 cu.ft) can be tricky to mount between the armpit and waist because it is too short. A simple belt loop can be made from two hose clips and a folded piece of 50 mm (2") webbing. beltattachment2 (74 kB) - a more profession version of the belt attachment made from welded stainless steel. blankingplug (66 kB) - a cheap blanking plug from a K cylinder keeps the muck out. This is a non-handed cylinder valve. 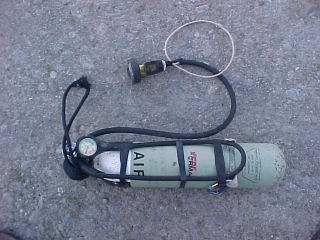 dressedbottle (74 kB) - a 7 l cylinder "dressed" with inner tube loops for stowage of gear - in this case a spare inflator hose. 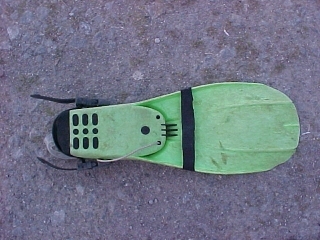 fin1 (71 kB) - a simple means of preventing loss of fins using a loop of inner tube and some elastic cord. Put on the fin as usual and pull the inner tube loop over the ankle. fin2 (73 kB) - another view of the fin and a good place to keep your mask. 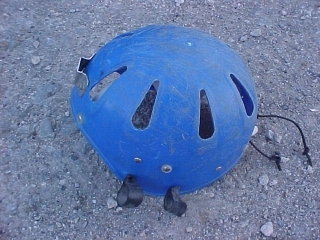 helmet (76 kB) - dry cavers wear a helmet to protect their skulls and somewhere to put their light. 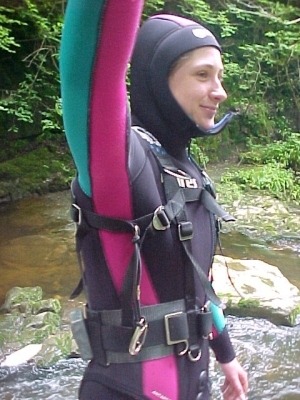 Cave divers do the same - it keeps their hands free. Extra lights can be attached to the side of the helmit using rubber bands ("snoopy loops") cut from old car tyres. 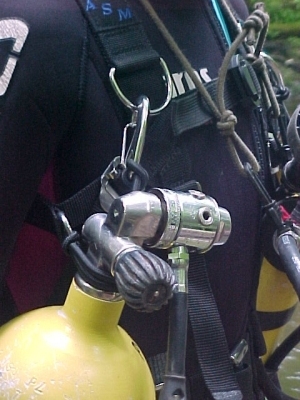 secondstage (80 kB) - modifications to a Poseidon Cyclon 2nd stage for cave diving: stocking trapped under the mouthpiece to stop grit getting in - clip for neck strap etc.